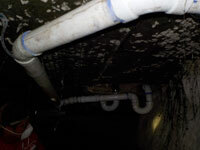 A1 Underground & Plumbing has designed systems for safely tunneling under the foundation of a residential/commercial building and repairing or replacing the pipes without cutting the floors. It starts with diagnosing the problem. 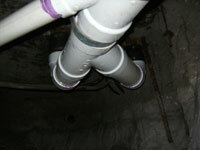 If necessary we can use a sewer camera to inspect and locate the problem. We remove the sand from under the building and we blow rock to backfill under the foundation. 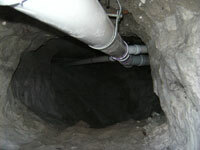 During the tunneling process the property can stay occupied with little to no disturbance on the inside. 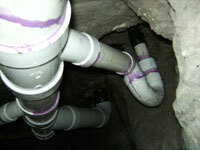 We have tunneled from 5 feet under the house to 450 feet under commercial buildings. By working with engineers we have developed the best methods for soil/rock compaction and maintaining the integrity of the property. We work with engineers on a constant basis by inspecting and testing the density of compaction and soil conditions to ensure the best results. Also we keep updating our systems and techniques with advances in technology. 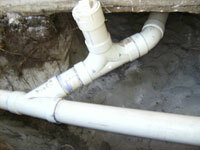 By not cutting the floors/walls the property can be maintained during the work process. Some jobs take a few hours others a few days depending on conditions. Our goal is to make the process as stress and worry free. A1 Underground will replace grass, concrete, pavers, asphalt, and rocks if necessary. 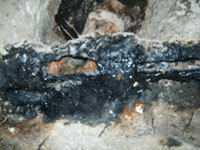 Our goal is to restore the property to the original condition as best as possible. We try to make it look like we were never there. All of our work has a one year warrantee. Using the newest camera technology we are able to make a recorded video showing the inside condition of pipes above and below the foundation. The owner gets a copy of the video to view and keep for records. 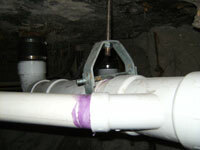 Through years of tunneling we have learned special methods for removing and restoring the sand/soil under the building. For weak soil conditions and long tunnels we have developed a rock blowing system that provides the best compaction under the foundation.